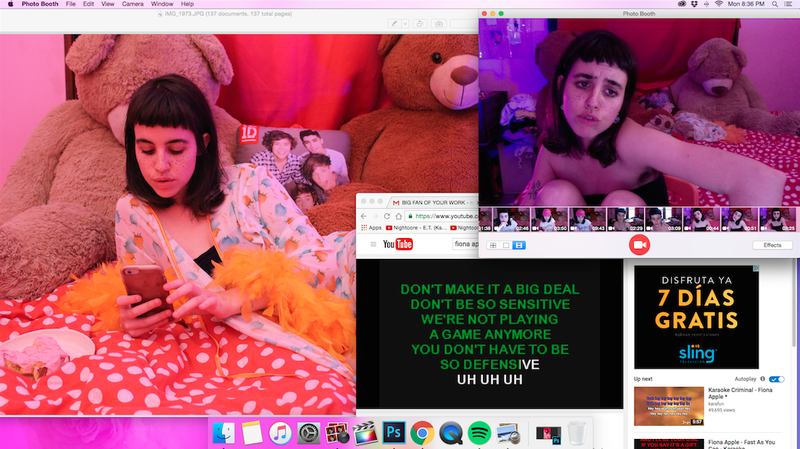 Annka Kultys Gallery is pleased to present Comfort Zone, an exhibition of new works by Molly Soda. 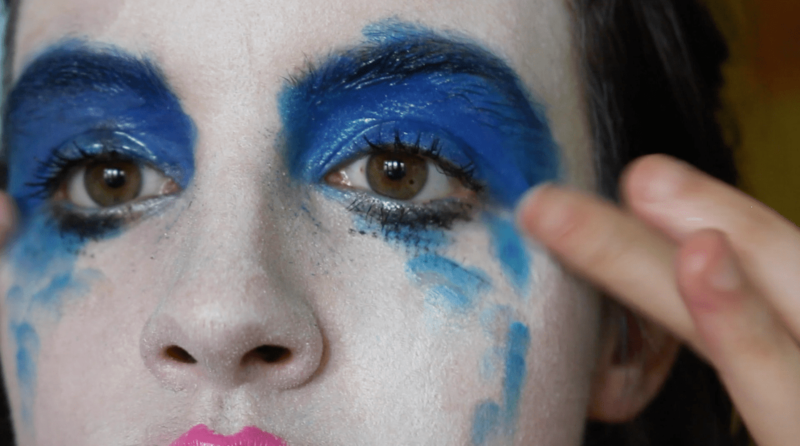 This will be the gallery’s second exhibition with the American artist since she joined in 2015. 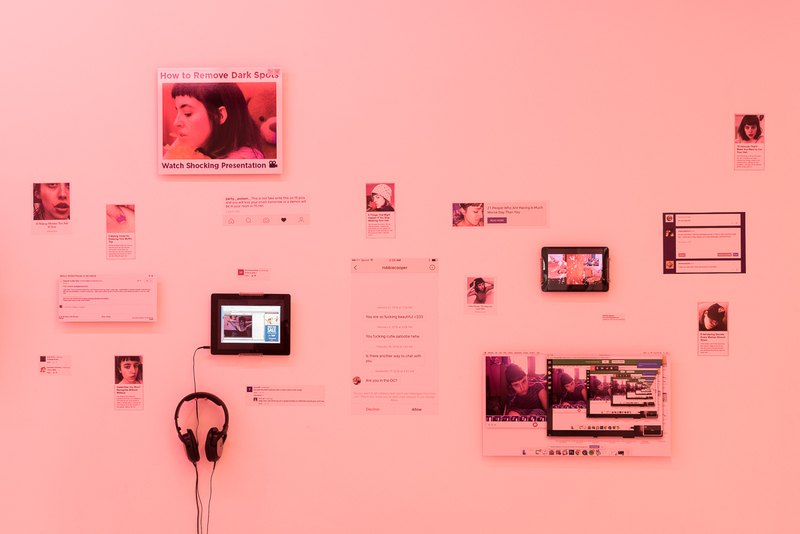 On view will be recent selfies and videos displayed on TV screens, iPads, laptops, and print and vinyl images mounted on walls, as well as resin sculptures. 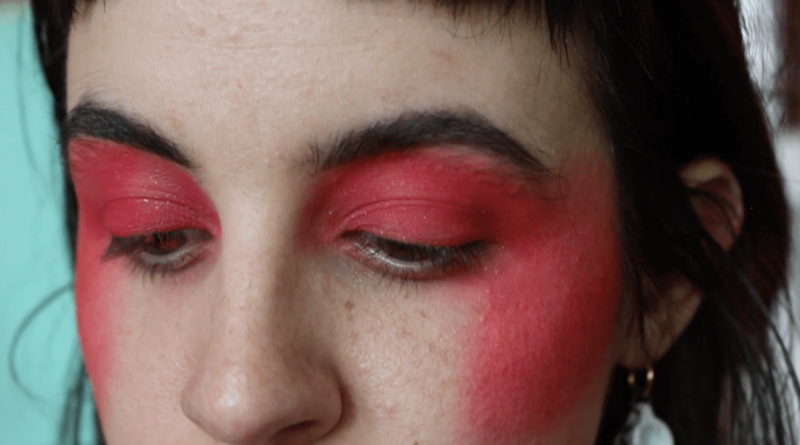 The first encounter with American artist Molly Soda’s work will probably not occur in a traditional gallery or museum setting and may not even occur within a typical art context at all. 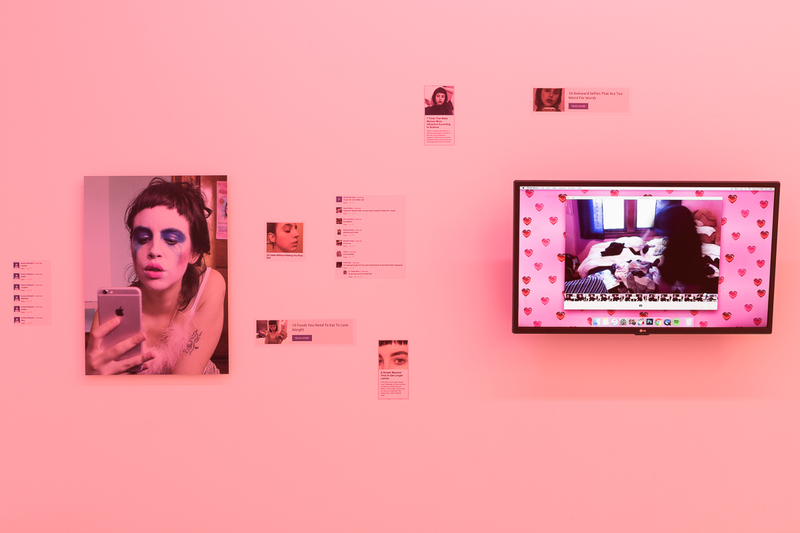 Instead Soda has generated a significant online following for herself across various social media by sharing her works on platforms such as Facebook, Tumblr and Twitter. 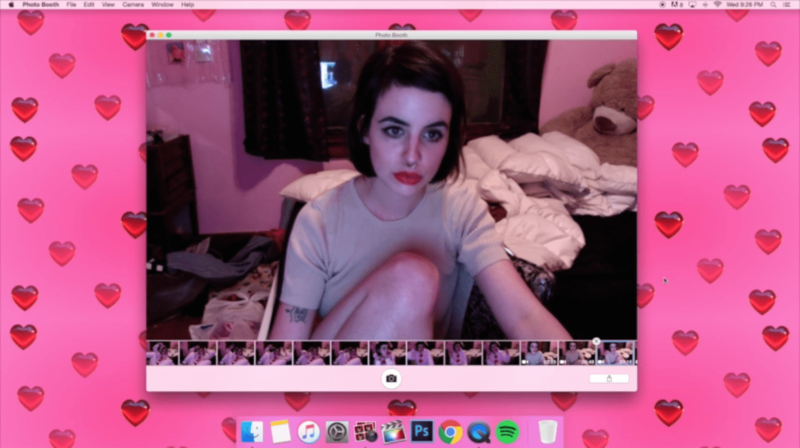 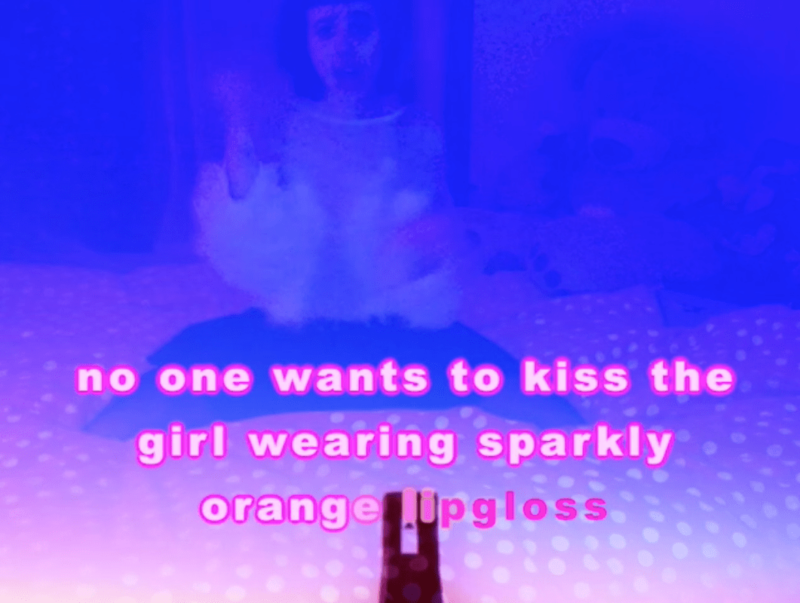 A self-described ‘webcam princess,’ Soda’s work spans the array of contemporary digital platforms, including Instagram selfies, YouTube videos, gifs, zines, web-based performance and tweets. 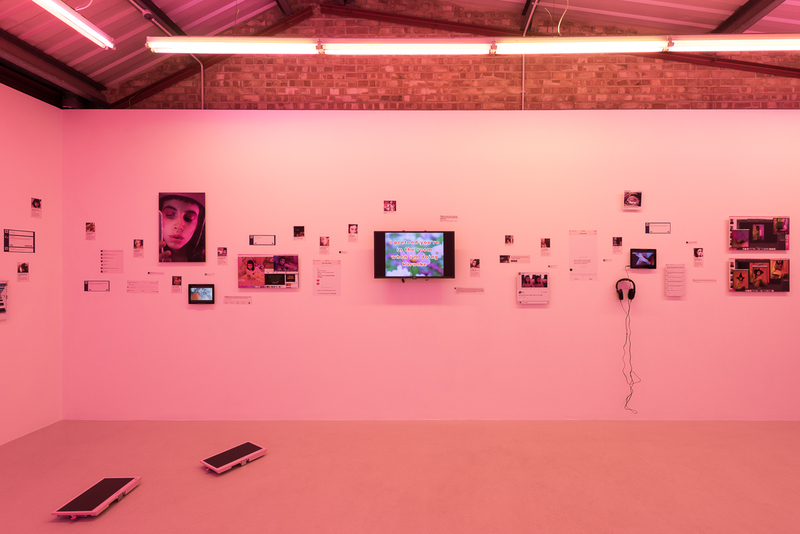 ‘There is so much we look at online that goes un-mentioned, stored away into our digital memory bank’, notes Soda. 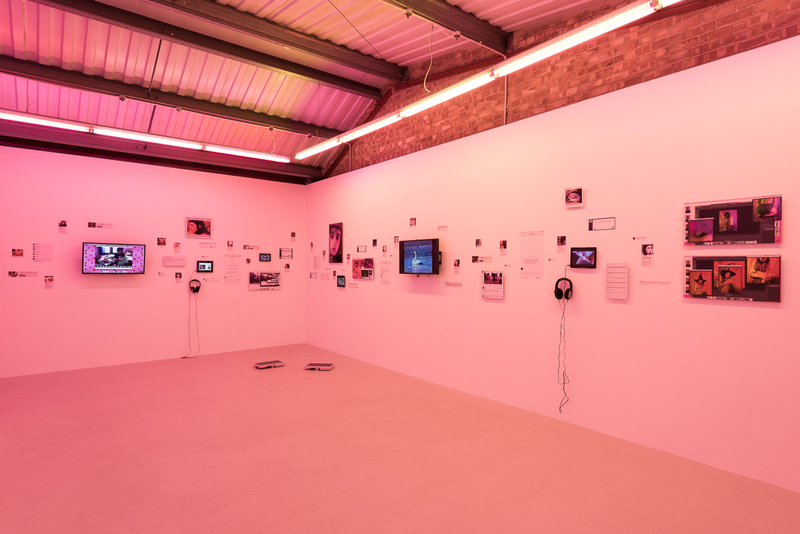 Through the chaotic combination of prints and video works covering the gallery, Comfort Zone explores how we engage with the electronic devices which confront our everyday existence with a never-ending buzz of notifications and instant messages, both in our public and private spaces. 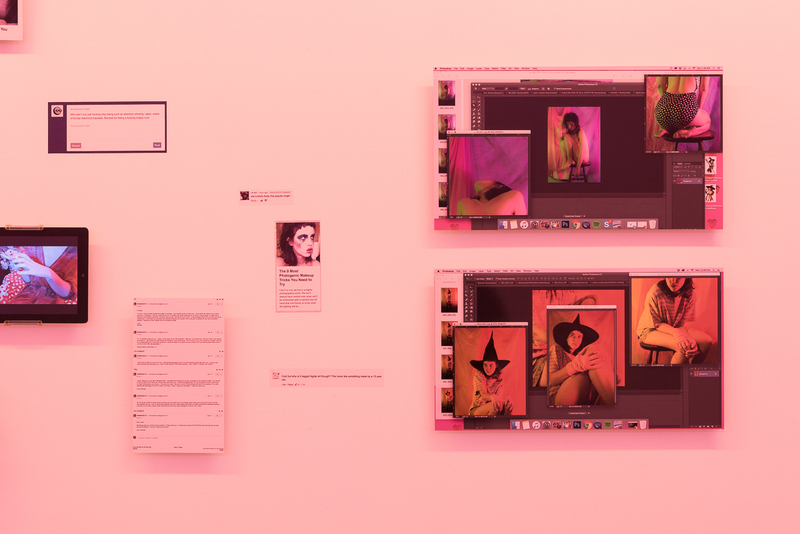 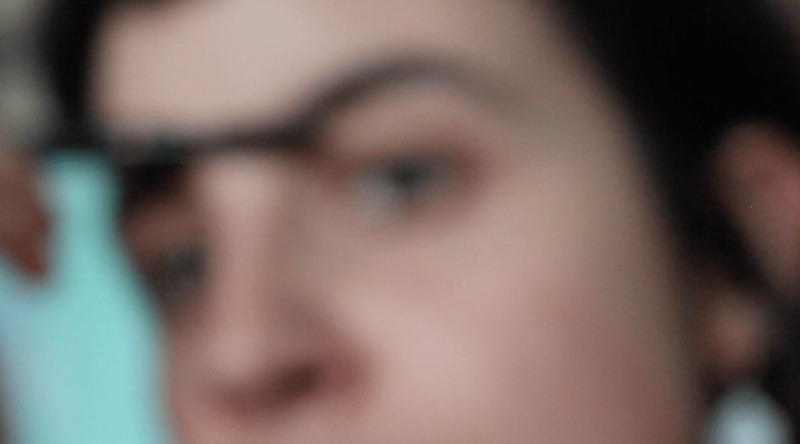 For her video All by myself (2016) , featured on a monitor within the show, Soda compiled 18 hours of footage taken from her MacBook’s PhotoBooth archive and publicly released the content en masse, content that was never intended to enter the public domain. 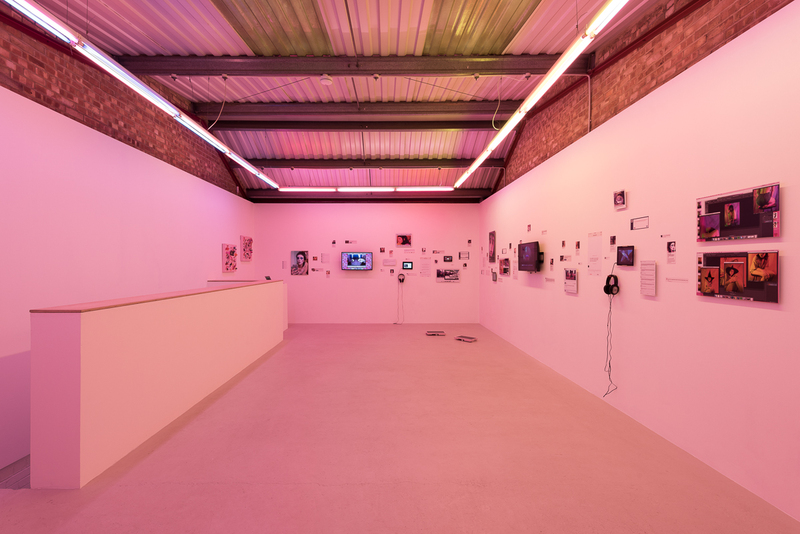 On the floor of the gallery two pink TV screens featuring All I have is my Phone (2016) and Phone Zone (2016) which feature Soda lying in her bed with red bedsheets with white dots, with her iPhone checking her messages, energetically sliding her finger to jump from one image to another, from one message to another, occasionally clicking and coming back. 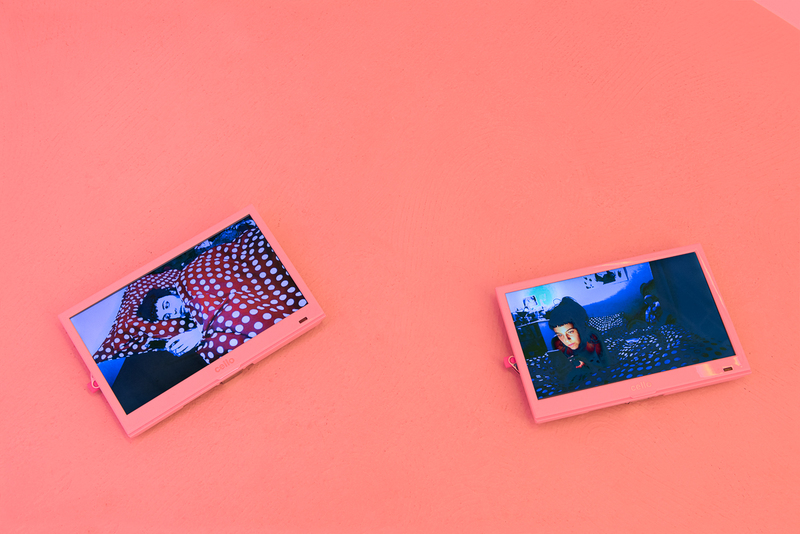 Mounted on the walls of the gallery will be a series of C-prints on aluminium. 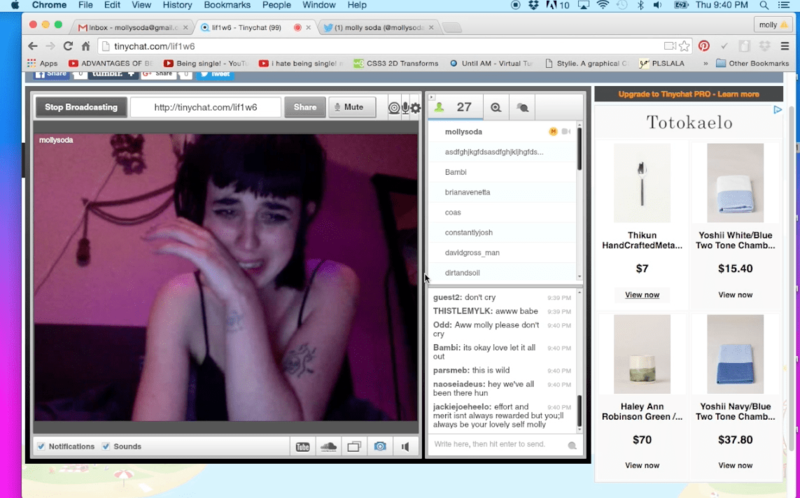 Some, such as I’m funny and I cry a lot (2016) and WRU? 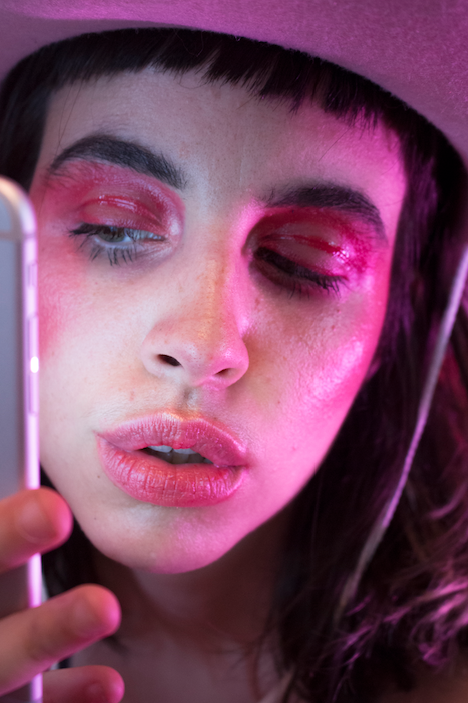 (2016), feature selfies of the artist as she constantly shares images of herself via her social media presence, while others are reinterpretations of advertisements commonly seen on social media where the artist has intervened and cropped out the usual images and replaced them with photos of herself. 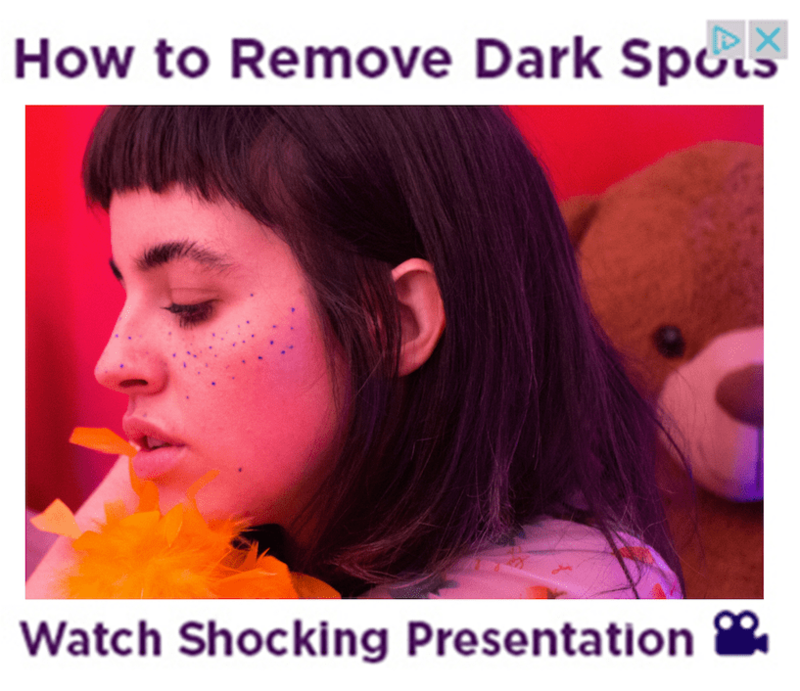 The works How to remove dark spots (2016) and Why she Never Married (2016), for example, play with the internet click-bait phenomenon of trying to attract visitors to particular web-pages. 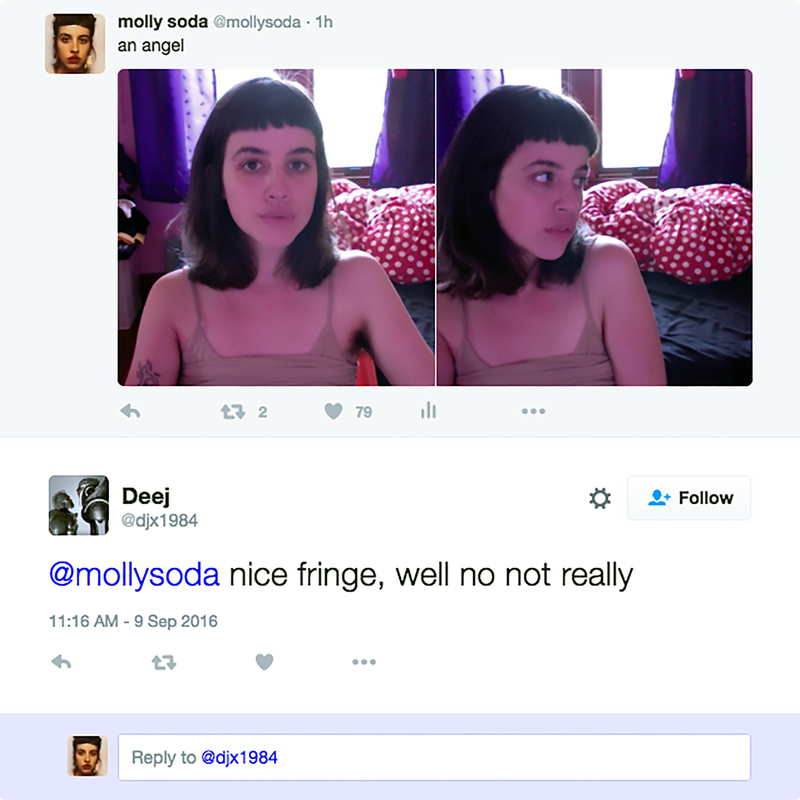 Other prints have been taken from screenshot images of the artist’s computer. 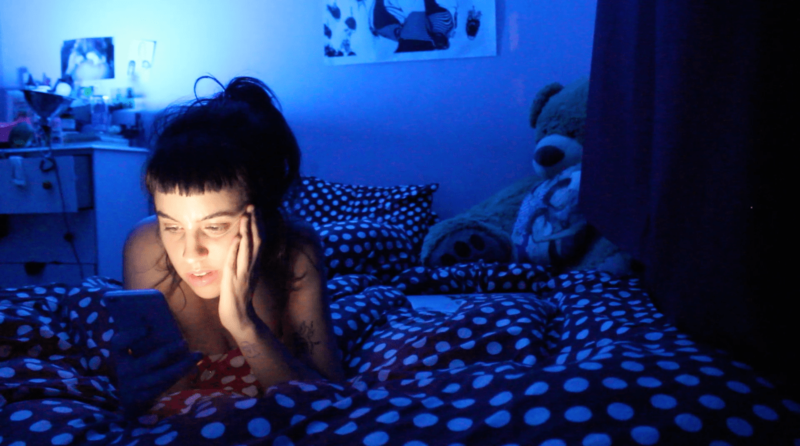 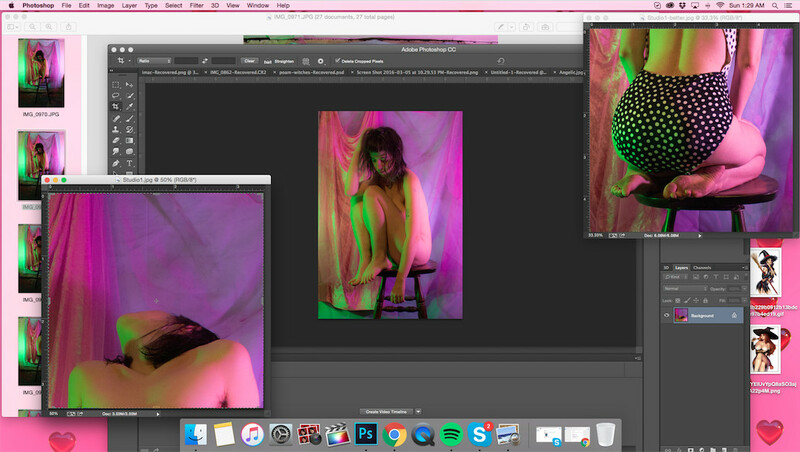 I am a Loner Dottie (2016) features Soda sitting on a chair wearing a bathing-suit against a pink background that contrasts with the green light reflected from her near-naked body. 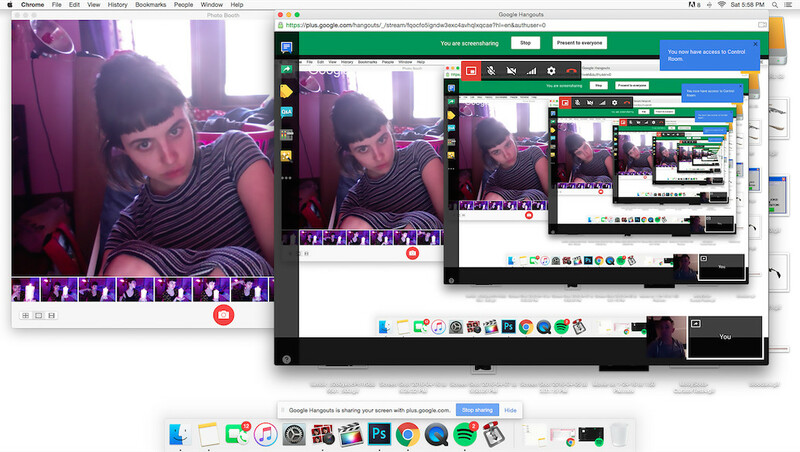 A final print Hangout Loop (2016), is notable for its Matryoshka doll-effect as an image of the artist singing is repeated into an infinitely diminishing visual endpoint. 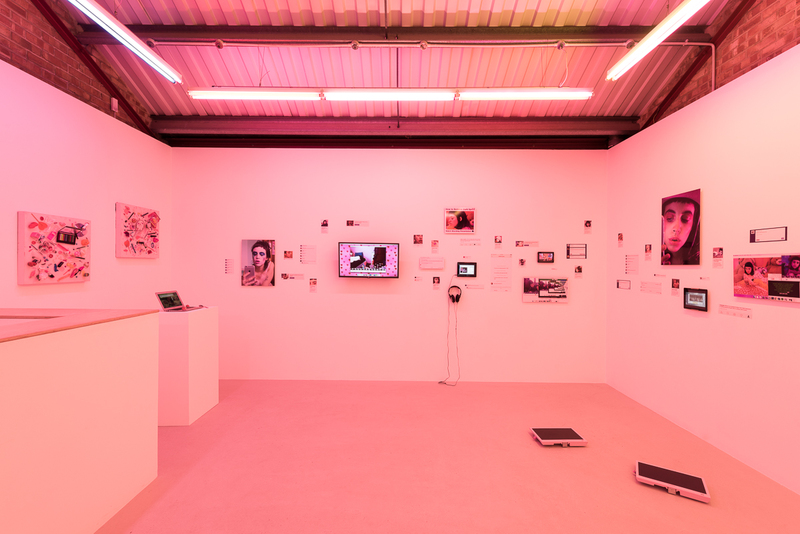 The piece references patterns of image circulation- an important trope in Soda’s works -displaying our refracted reality, as well as our expanded levels of engagement with images and our newly enhanced abilities to produce and consume them. 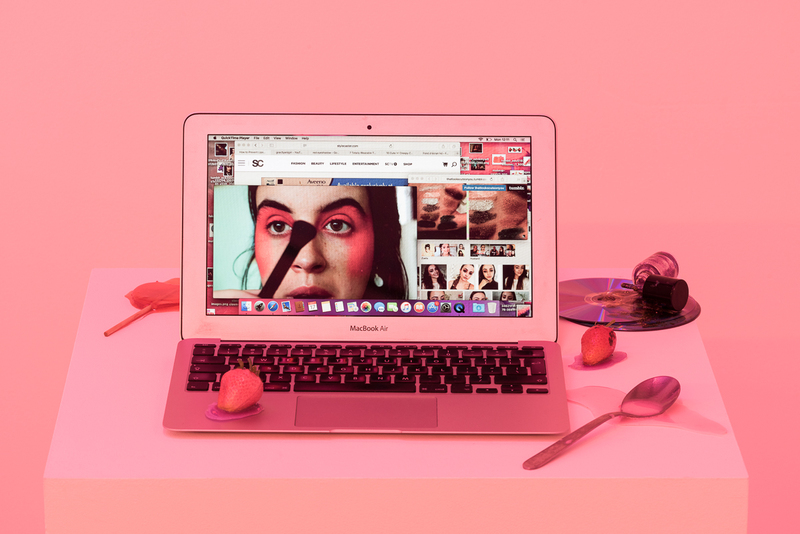 Comfort Zone brings together the artist’s exploration of how instant messaging, constant sharing, retweeting and ranking through likes, invades and permeates our lives today. 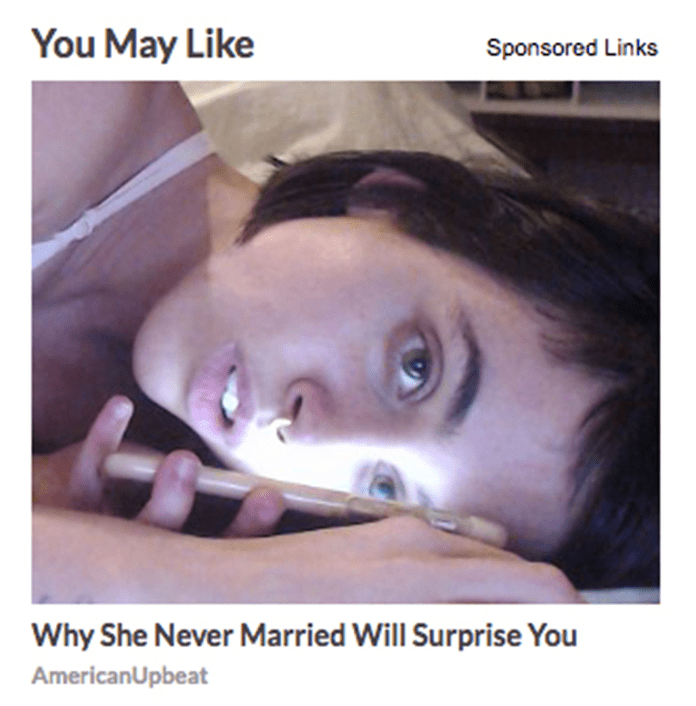 All these technologies profoundly affect our concept of human identity and the relationship between the public and the private realms. 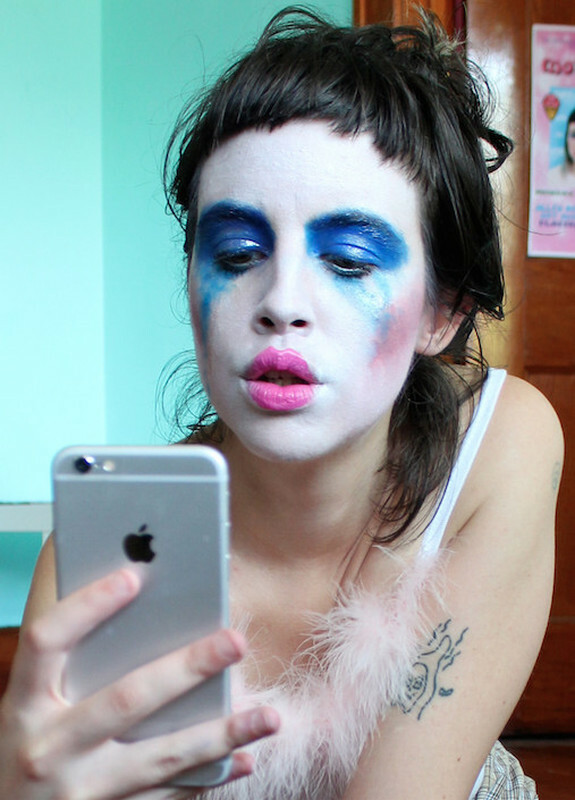 Molly Soda was born Amalia Soto in 1989 in San Juan, Puerto Rico and currently lives and works in Detroit, Michigan. 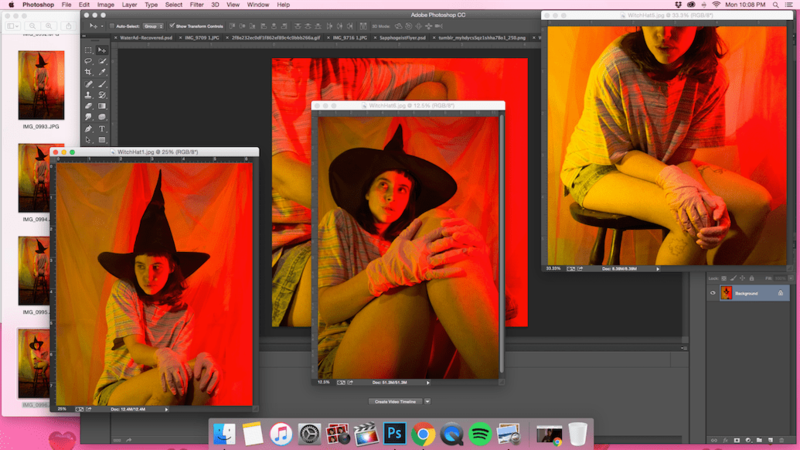 She received her BFA in Photography and Imaging from New York University in 2011. 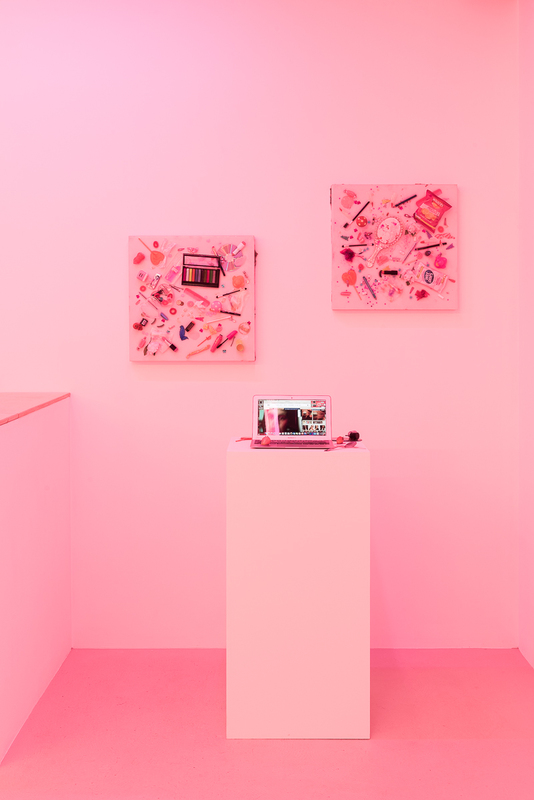 Her recent solo shows include Comfort Zone, Annka Kultys Gallery (2016) and From my bedroom to yours, Annka Kultys Gallery (2015). 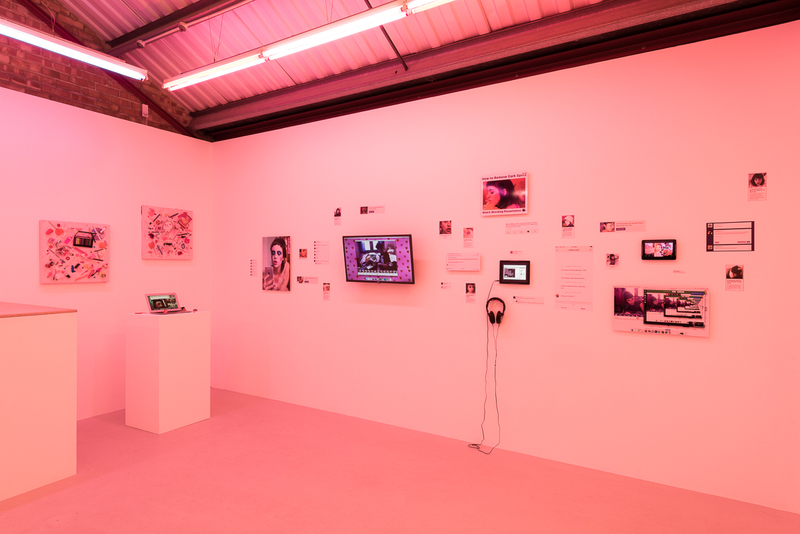 She also participated in PADDLES ON!, the first ever digital art auction and gallery show held by Phillips auction house, New York, in 2013, at which she sold her piece ‘Inbox Full’ (2013), an eight-hour webcam video of Soda reading all of the messages in her Tumblr inbox.